These lighter old fashioned pancakes are made with lighter ingredients. Yet they are super fluffy and so good that my kids ate them straight off the pan. They couldn’t resist! 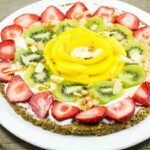 In this recipe, I substituted whole eggs for only egg whites. 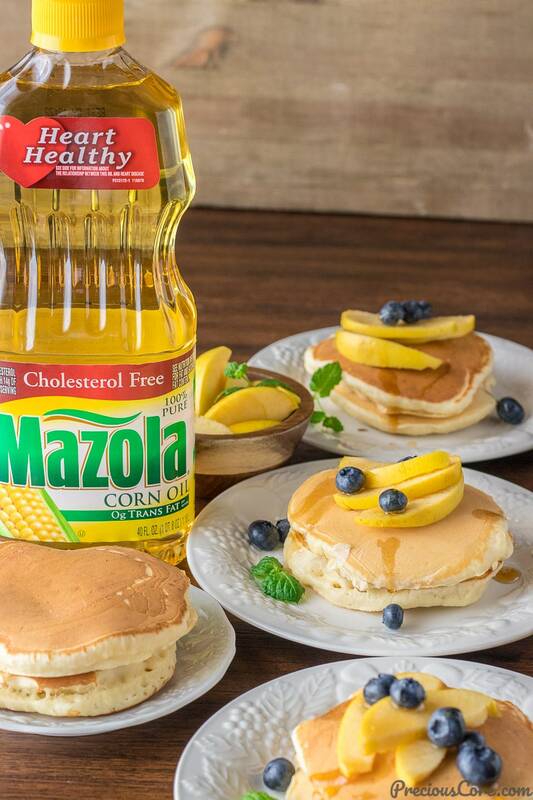 Then I substituted sugar for honey and I substituted butter for corn oil, specifically Mazola® Corn Oil. 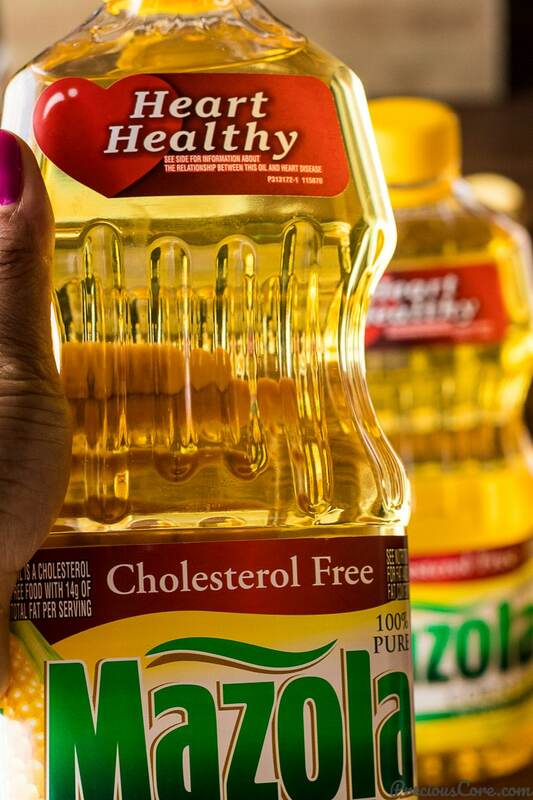 A clinical study showed that Mazola Corn Oil reduces cholesterol 2x more than extra virgin olive oil. To learn more about this claim, see Mazola.com. 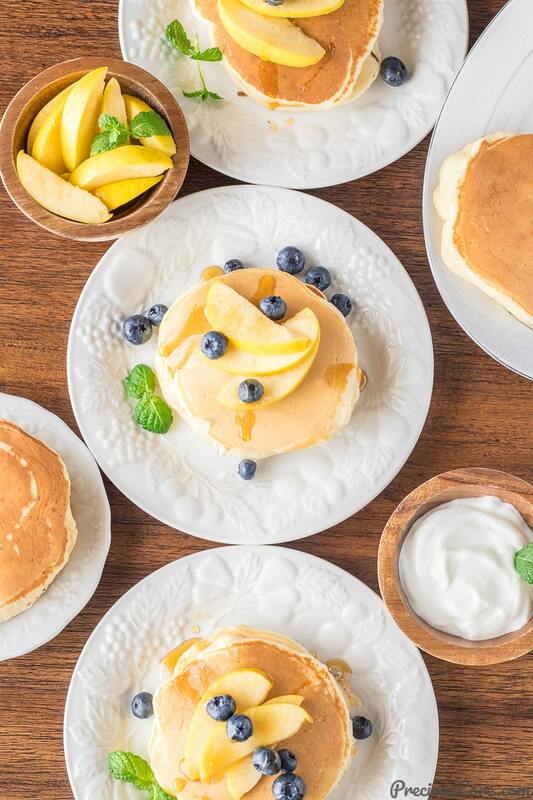 We love pancakes around here! 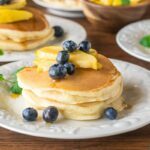 African style pancakes, coconut pancakes, banana pancakes, we love them all! I don’t think I will ever give up pancakes. 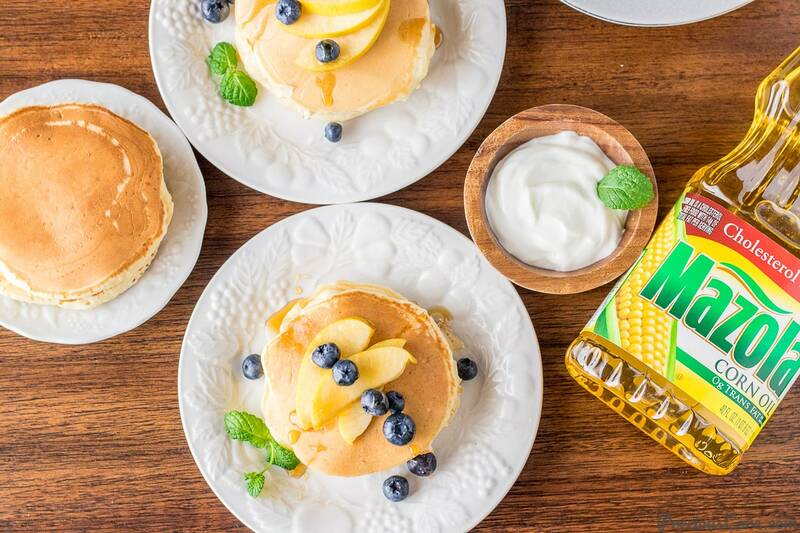 That’s why healthier alternatives like these Lighter Old Fashioned Pancakes are right up in my alley. 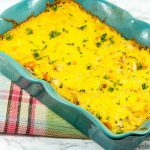 Corn oil is the ideal replacement for butter in this recipe. 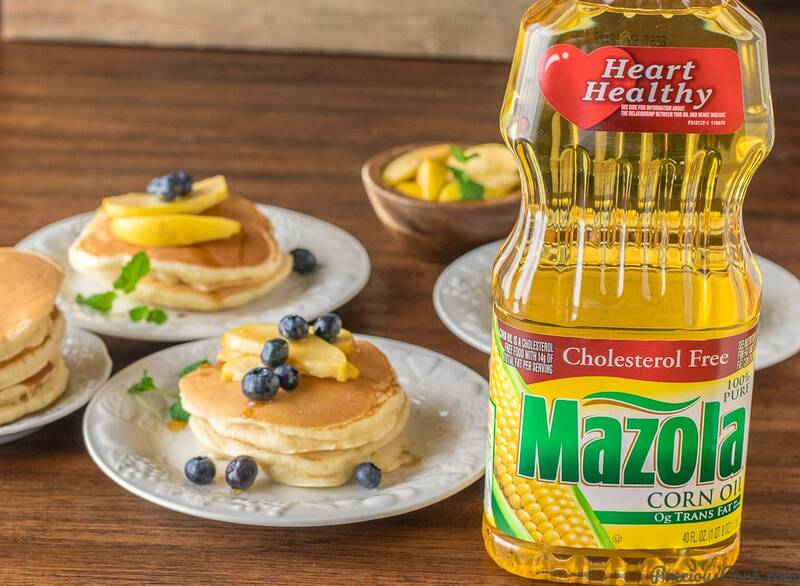 Mazola Corn Oil is an all-purpose oil which is a smart healthy choice for the family. You can use it for many things like baking, sautéing, grilling, stir-frying or mixing up a marinade or dressing. 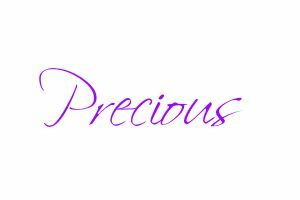 It is so versatile and it’s good that you can enjoy it guilt-free. Also, Mazola corn oil has a neutral taste which is awesome because it allows the flavor of your food to shine. Besides, corn oil like Mazola has a smoke point higher than most cooking oils at 450°F. It performs well when used to cook in different ways like stir-frying, sautéing, grilling, and even baking. 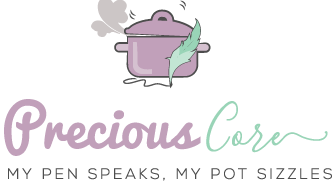 Most home cooks do not know that every oil has a smoke point that when exceeded could result in a loss of nutrients and loss of flavor in the food. Corn oil, together with flour, milk, egg whites, honey, baking powder, and salt are the perfect ingredients for lighter pancakes. When combined, the result is pancakes that are just as fluffy, just as good as the famous old-fashioned ones. When I asked my oldest daughter to describe the pancakes, she said one important word, “fluffy!” That’s right, they are super fluffy! They are sweet but not too sweet. I used honey to sweeten them but if honey is not your thing, use real maple syrup. One thing I will note about these pancakes is they do not contain a ridiculous amount of baking powder. Some pancake recipes online call for huge amounts of baking powder, which in my opinion is disproportionate to the quantity of flour. Besides, so much baking powder could lend a bitter taste to your pancakes and that’s just not good. I find that, using 1 teaspoon of baking powder to 1 cup of flour works well here. 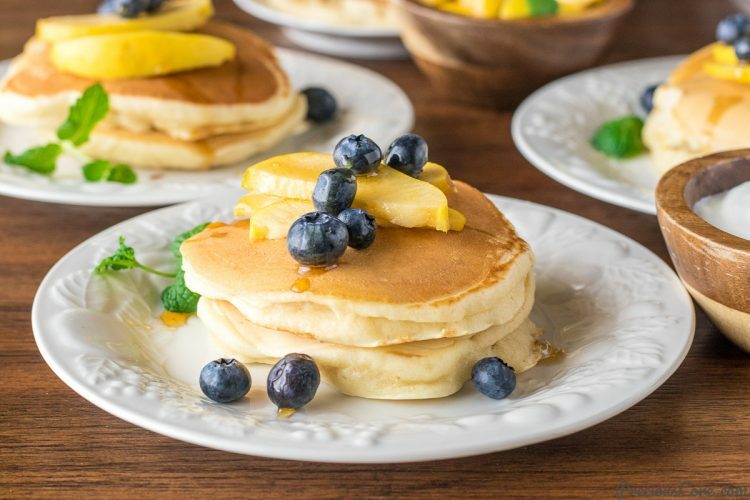 Plus with 4 egg whites and a cup and a quarter of milk in this recipe, you get nice soft fluffy pancakes which are slightly crispy on the edges and just a delight for breakfast. Or maybe a delight for brunch? Or maybe a delight for dinner? Truth is I will eat these any time of the day! No shame in my game. 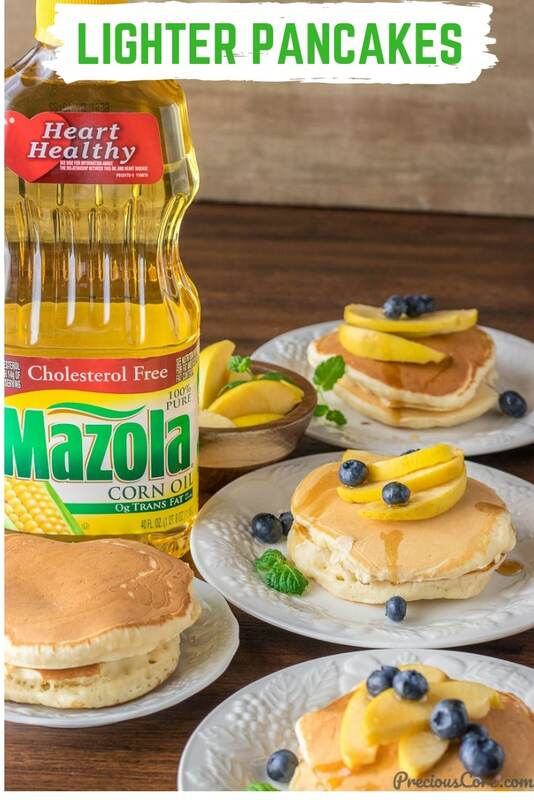 Learn more about Mazola corn oil here. Let’s make some lighter old fashioned pancakes, shall we? These lighter old fashioned pancakes are made with lighter ingredients. Yet they are super fluffy and so good that my kids ate them straight off the pan. They couldn't resist! In a bowl, mix together the flour, salt, baking powder. In another bowl, beat the egg whites using an electric mixer until a peak forms. Add the milk, honey, corn oil and vanilla extract and beat just until combined. Pour half of the egg mixture into the flour mixture and mix to combine. Add the remaining egg mixture and mix to form a batter. Heat up a skillet on low heat or griddle then lightly brush with corn oil. Add a quarter cup of the batter and gently swirl to make a circle (or something like it. ha). Let it cook until bubbles form at the top. About 2-3 minutes. Flip to the other side and let it cook for another 2 minutes. Repeat process with the rest of the batter. Serve warm with your favorite pancake toppings! 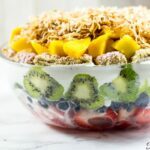 To maintain the healthier path, I suggest serving it with some Greek yogurt and fresh fruit. Enjoy! 1. Use a non-stick pan for best results with these pancakes. 2. To reheat pancakes, place on a plate, cover with paper towel and heat on high for 1 minute in the microwave. 3. These pancakes freeze well so I suggest you make a big batch and freeze for future breakfasts. Pancakes with honey? Never tried that but am sure it’d be great. And oh the egg white part is to die for. you have baking powder in the recipe yet you say in the narrative that you use 1tsp of baking soda to 1 cup of flour, with 4 egg whites…which is it? Hi, it is actually baking powder. Thanks so much for the catch! The post has been updated.